Il est vivement recommandé de participer à la révision avant examens les 2 et 3 mai 2019.
ou de participer au cours complet sur 18 jours du 13 au 20 avril puis du 26 avril au 5 mai 2019. Coût CHF 990.- examens, cotisation SRF et Certification IRF inclus. Les guides désireux de changer la photographie sur leur Certification 2019-2020 peuvent l’envoyer par e-mail à rafting@swissraftingfederation.ch ou par courrier à Swiss Rafting Federation, case postale 73, 1226 THONEX, Genève. Ne pas oublier de mettre votre nom au dos ! Les cours de formation ne devant pas dépasser le degré de difficulté 4, le niveau des Instructeurs IRF est rétrogradé à 4. La classe 4/5 n’existe plus et est remplacée par la classe 4. Votre Fédération a fait une demande au GTE Committee pour conserver le Level 5 afin d’être couvert par l’assurance responsabilité civile en cas d’accident. Nous attendons la réponse. Regional Assessors. Regional Assessors are being appointed to oversee all Instructors who conduct workshops within a specific region: duties, revenues, disciplinary procedures and traveling instructors’ ethics. Instructor Candidate Certification Process. The requirements for obtaining a GTE Instructor certification will be more strictly observed, especially the requirement of previous guide training experience (as stated in the existing AS). Assessors are required to be more rigorous and meticulous when assessing candidates to ensure that all Instructors are conforming with the established norms. Except in cases where the Instructor candidate can prove extensive experience as a guide trainer/instructor, all candidates must first hold an IRF Trip Leader certification thus gaining a better understanding of the GTE assessment curriculum and skills requirements. Instructor Certification Renewals. To remain active, all Instructors must conduct a minimum of 2 GTE workshops every 2 years. To remain current, they must also renew their certification every 3 years by either 1) conducting or attending a workshop that is overseen by an Assessor, or by 2) attending a GTE conference. Instructors that do not follow the above protocols will be listed as inactive or expired respectively. Inactive or expired Instructors will be required to complete the renewal process noted above to regain active status. There will be a fee charged if an Instructor needs a new certification card to be issued. Instructors who remain active and current will not be required to pay renewal fees. Name Change for Certifications. The nomenclature of awards had been changed. ‘Class’ has been renamed to ‘Level’ to avoid confusion with the river classification system. The awards available are now Level 2, 3, 4 and 5. Practical assessments will still be conducted on a river section whose classification corresponds to the Level awarded (or higher). For example a Level 3 certification may only be awarded after a candidate has been successfully assessed on a Class 3 rapid/river section. Class 4/5 Certificates are discontinued and have been separated into Level 4 and Level 5. Existing Class 4/5 certificates will be downgraded to Level 4 when they are renewed. Assessors and current Class 4/5 Instructors are now only authorized to award certifications up to Level 4 (Class 4), and run practical assessments only on rapids/river sections up to class 4. 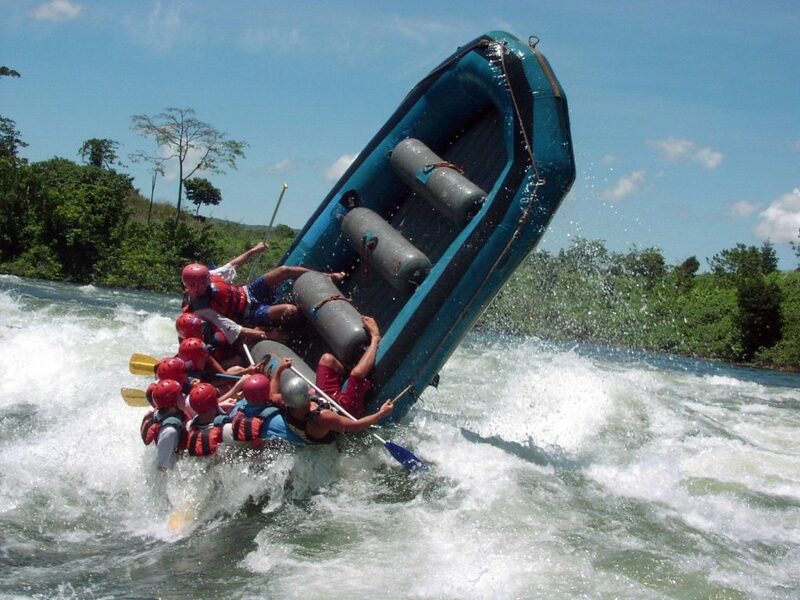 Level 5 certificates will not be awarded by Assessors or Instructors, but will only be awarded through an administration review process which includes a written recommendation by an IRF Instructor or Assessor, and documented proof of extensive experience on multiple class 5 rapids/river sections. “Site Specific” Certificate. 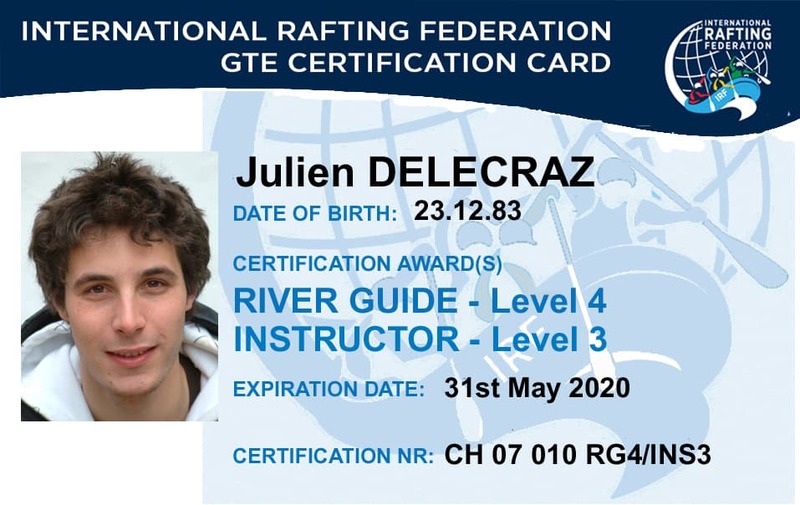 This certificate will be awarded in all cases where a candidate is experienced as a guide on a single river or section of river but has no documented guiding experience on other rivers of the same classification. This new certificate will also replace the “Stadium Guide” certification for artificial courses. For example, if a Zambezi river guide successfully completes an assessment conducted on the Zambezi river, but has no documented experience on other rivers of a similar classification, he/she will be awarded a Site Specific, Zambezi River certification. 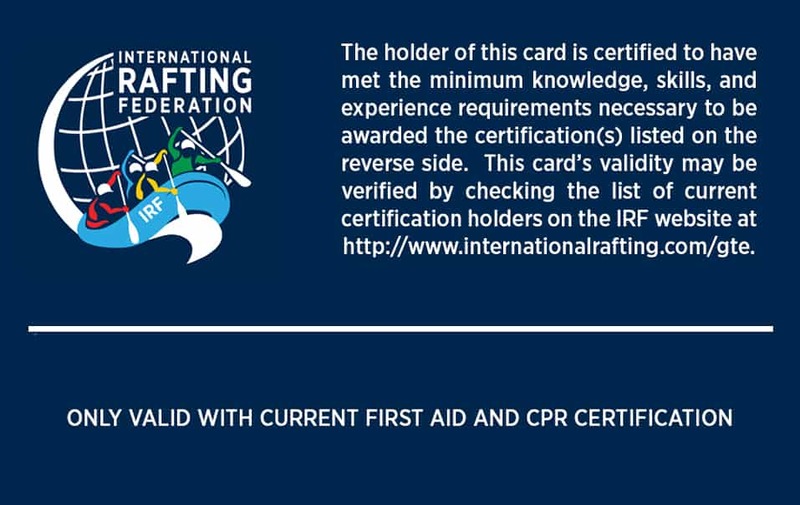 “Provisional” Certificate: replacing trainee guide certificates and more, see definition in IRF Award System document. Throwbag test. The throwbag test as a minimum requirement for raft guide assessments has been updated. Details of the new test procedure are found here. To become an IRF GTE Assessor. Assessment criteria. Online GTE Database administration. A modern online system for entering workshop data has been developed that will be ready for use soon (link will be placed here). All Assessors and Instructors will receive password access and be required to enter the details of their assessments and the candidates that they have certified directly into the online system. All individuals that have been awarded an IRF certification of any type will have password protected access to keep their personal details up to date, and will receive automatic email renewal notifications. Involvement at IRF Raft Race Events – IRF Race Rules require that GTE certified personnel are members of the safety team at all major IRF sanctioned races. All GTE documents have been updated/changed (IRF GTE Award System V2.2). Instructors and Assessors are advised to get familiar with their changes BEFORE conducting your next assessment workshop. If you receive emails from any of the IRF GTE appointed persons handling these issues please take note and respond accordingly. These changes are being implemented so as to improve the GTE program and ensure it stays as the leading certification system internationally for all river users.